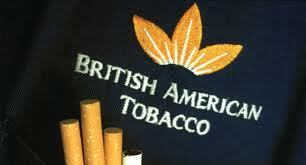 British American Tobacco Bangladesh Company Limited started its business as a corporate identity of British American Tobacco Group, which was previously known as Bangladesh Tobacco Company and after liberation it renamed itself as British American Tobacco. The Food and allied industry is very competitive with intense intra industry rivalry among the companies. The threats of new entrants, threats of substitute are very low. Power of buyer is quite low but suppliers groups are enjoying the benefit of strong and favorable bargaining power. British American Tobacco Bangladesh Company has a bit abnormality in the recent years. They have declared a large number of dividends and have created a leap in the flow. We have seen the growth rate to fall and the retention rate as well. However the performance of the company in the overall industry was a big success. In the time of recession the firm has shown promise in their performance, which indicates a lower level risk involved in the security with high return. This report has been made as a part of my course Intermediate Accounting; Mrs. Jafrin Sultana has assigned us this report in order to gain some practical knowledge about how to conclude on investment decision and analysis on the basis of Top Down approach. The perspective of such a report is to make us familiar with the key factors of security market that affect the users in decision making. For this purpose I have chosen the annual report of British American Tobacco Bangladesh Company Limited, and try to analyze and understand the components according to my best effort. To conclude some findings and some possible recommendation for an investor who wants to invest in the share of BAT Bangladesh. The first limitation is the lack of intellectual thought and analytical ability to make it the most perfect one. We have to offset with the quality due to time constraint. The analysis is based on complicated data, so it has become difficult to draw a complete figure. While attempting to analyze the performance many data were missing, we found it rare to make it consistent with theoretical formula. Cross sectional analysis consist of the overall condition of different industry. To find out the rates of return among different industries varied during a given time period, we compared the performance of alternative industries during a specific time period. In the below graph we can see the conditions of the industries at a glance. Here Pharmaceuticals and Chemicals have the highest statue among the other industries on the basis of EPS. The EPS ratio on the particular companies of Pharmaceuticals and Chemicals industry has higher average rate then the companies of other industries. On the perspective of the ROI Bank has the utmost advantage. The return for equity is higher in the bank sector. Comperatively the profit for Bank on an overall basis is higher then other sectors. The industry performance takes different shape over the time of its activity. It is not necessary for the industry to perform at the same pace every year. Thus, as over the time analysis shows an easier way to realize the actual growth or decline. 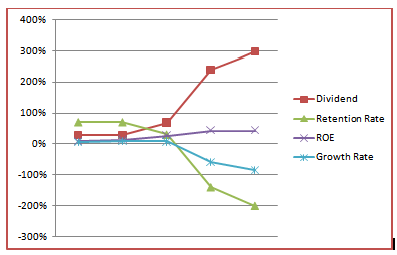 In the food industry, the graph shows an elaborate performance condition. 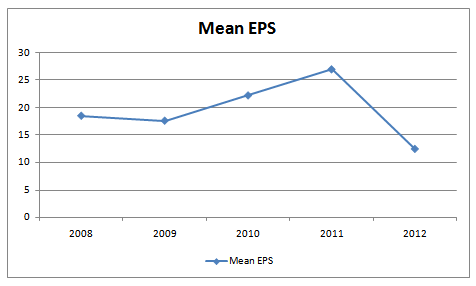 Due to the decrease in the profit margin of different companies in the year of 2009 the graph has taken a negative dive. So the industry as a whole has declined in the last except the preceding years. Even though the profit margin of the industry as an aggregate measure has taken a declining position, The British American Tobacco continued its growth. If we look at the graph bellow we can say it with certainty. The reason for this difference is that, BATBC didn’t follow the pattern of food industry. As a part of tobacco industry, its value stands apart from the overall industry. 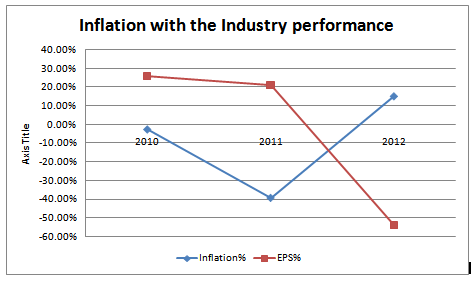 Economic trends can and do affect industry performance. By identifying and monitoring key assumptions and variables, we can monitor the economy and gauge the implications of new information on our economic outlook and industry analysis. Recall that in order to “beat the market” on a risk-adjusted basis, we must have forecasts that differ from the market consensus and we must be correct more often than not. Higher inflation is generally negative for the stock market, because it causes higher market interest rates, it increases uncertainty about future prices and costs, and it harms firms that cannot pass their cost increases on to consumers. Although, some industries benefit from inflation but food sector is excluded from them. The graph bellow shows the Graphical presentation of the effect. High interest rate is often good for several industries. Risk and the return depend highly on it. Based on the different bank rate for corporate short term and long term loan, the average of interest for interest sector is 13%. Bangladesh food industry deals with large number of exporting business in the international market. Hence, it brings a lot of foreign currency. For instance BATBC exports quality leaf to its parent company which is grown in. BATBC has been able to maintain a unique product at a premium cost that a customer will pay willingly. It has been serving the mass people of the country. As the production is in a large scale we can say it is having economies of scale. It is frequently trying to bring new products for the customers. It has a much diversified product line with frequent research and development to improve product quality and to offer innovative products according to customers taste. So, they are mainly following the Differentiation strategy rather than Cost Leadership. Besides the brand value of BATBC has made the customers less price sensitive as they emphasize more on the brand value. Demography is the study of human population in terms of size, density, location, age, gender, race occupation and other statistics. A large number of people in the world like smoking either in various location or occupation, at different age. It does not depend on classification of gender. But in our country, Tobacco Company target mainly adult person like male individuals and so as the young person who like smoking. Based on income level BATBC produce different types of cigarettes. Lifestyle also influences our tobacco industry. At this modern era smoking is the common phenomena and many people take smoking as of their class lifestyle. So the tobacco industry always try to offer that kinds of product which must be consistent with their lifestyle. There are over 18,000 different food items in today’s supermarkets, which are processed to a greater or lesser degree, and thousands of new products are introduced each year. These products need different kinds of processing. Mostly used technologies in food sectors are- Refrigeration, freezing, drying, control of water activity, microbiological spoilage, enzymatic degradation, chemical degradation, Pasteurization, Sterilization (canning),Cleaning and sanitizing, Membrane processing, Mixing, Fluid flow, Size reduction (homogenization), Heat transfer (heating), Fluid flow, Heat transfer (cooling), Mass transfer (conversion of water to vapor during drying),etc. Filter pellet technology, cigarette menthol, etc. Smoke-free environments: Bangladesh has a complete smoking ban in healthcare facilities and educational facilities. Smoking is also banned in other workplaces and public places, however the law allows for designated smoking areas. Advertising, promotion and sponsorship: Bangladesh does not have a comprehensive national ban on advertising, promotion and sponsorship. Tobacco companies are permitted to advertise through international print media, at point-of-sale, and on the Internet among other mediums. Warning labels: Warnings are text-only and cover 30 percent of the front and back of packages. Warnings are not applied to smokeless tobacco products. Tobacco taxes: Tobacco taxes in Bangladesh are below the rate recommended by the World Bank (from 65 percent to 80 percent of retail price) that is commonly present in countries with effective tobacco control policies. Bidis in particular are available at very low prices. Life cycle means the normal stages that a product passes through: research and development, growth, expansion, maturity, saturation, and decline. In the research stage, there are no sales at all. In the growth stage, sales are slow and often need to be supplemented by heavy sales and advertising efforts. In the expansion stage, sales may grow more rapidly. 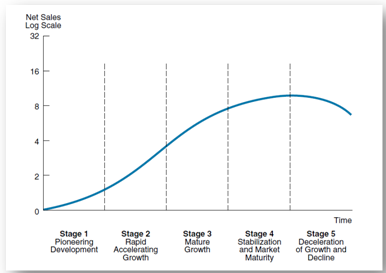 In the maturity stage, sales start slowing down as most people who might want the product already has it. In the saturation stage, everyone who wants the product has it, and there are few opportunities for increasing sales. In the decline stage, sales fall and the product eventually becomes obsolete. The overall growth of the economy in Bangladesh is 6.2%. And compare to that the profit margin for food industry has risen to 21% in a year. By considering the last few years earning per share of food industries and as well as the tobacco industry, we found the gradually increase in the earning per share. So, we assume that this industry still is on its mature growth stage. 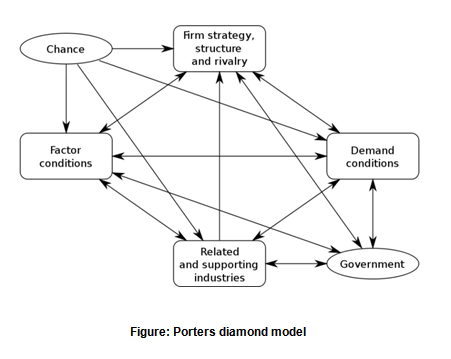 The diamond model is an economical model developed by Michael Porter in his book The Competitive Advantage of Nations, where he published his theory of why particular industries become competitive in particular locations .The diamond model of Michael Porter for the competitive advantages of nations offers a model that can help understand the competitive position of a nation in a global competition. Factor conditions are human resources, physical resources, knowledge resources, capital resources and infrastructure. Specialized resources are often specific for an industry and important for its competitiveness. Specific resources can be created to compensate for factor disadvantages. Demand conditions in the home market can help companies create a competitive advantage, when sophisticated home market buyers pressure firms to innovate faster and to create more advanced products that those of competitors. Related and supporting industries can produce inputs which are important for innovation and internationalization. These industries provide cost-effective inputs, but they also participate in the upgrading process, thus stimulating other companies in the chain to innovate. Firm strategy, structure and rivalry constitute the fourth determinant of competitiveness. The way in which companies are created, set goals and are managed is important for success. But the presence of intense rivalry in the home base is also important; it creates pressure to innovate in order to upgrade competitiveness. Government can influence each of the above four determinants of competitiveness. Clearly government can influence the supply conditions of key production factors, demand conditions in the home market, and competition between firms. Government interventions can occur at local, regional, national or supranational level. Chance events are occurrences that are outside of control of a firm. They are important because they create discontinuities in which some gain competitive positions and some lose. The Porter thesis is that these factors interact with each other to create conditions where innovation and improved competitiveness occurs. To understand the pattern or flow of operating activity, company’s marginal income, overhead cost management, more easily we present the income statement as a percentage of sales. Before 2007 BAT Bangladesh used to include its operating expenses under cost of sales. So instead of gross profit it is better to analyses the net operating profit before Interest and tax. There is a rise in the net operating profit as well as a decrease in the total cost over 5 years of period, though the supplementary duty has been raised. However profit after tax is increase in last two years. For investment purpose it is very important to get a proper bottom line so that dividend can be distributed. In internal liquidity ratios there are Current ratio, Quick ratio and Cash ratio which shows the condition of the liquidity of the organization in terms of liquidity. They have a progressive state in the years to come. Before 2007 their annual report used to show the operating expenses under cost of sales, as a result the gross profit margin is significantly lower in 2005 and 2006 compare to the rest. However if we analyze the table the fact reveal that, the turnover across last 5 years has increased tremendously. The reason behind this might be an increase in the per unit selling price of their consumer product. Whatever the fact is, their Net Income tends to increase gradually and for the last two years maintaining a sustainable position. This ratio is a qualitative analysis of a firm’s marketing and credit policy and debtors realizations. In other words, if the firm sells goods on credit, the realization of sells revenue is delayed and the receivables (both debtors and/or bills) are created. It is calculated to know the uncollected portion of credit sales in the form of debtors by establishing relationship between trade debtors & net credit sales of the business. Higher the value of debtors’ turnover, the more efficient is the management of debtors. An increase in this ratio is an indication of firm’s marketing superiority and efficiency in credit realization. Sales Variability is the prime determinant of earnings variability. In turn, the variability of sales is mainly caused by a firm’s industry and is largely outside the control of management. 2. The rate of return earned on the resources retained and reinvested. Due to the high rate of dividend declared the growth has decreased in the present year. It has also effected the retention rate. The importance of ROE as an indicator of performance makes it desirable to divide the ratio into several components that provide insights into the causes of a firm’s ROE or any changes in it. This breakdown of ROE into component ratios is generally referred to as the DuPont system. To begin, the return on equity (ROE) ratio can be broken down into two ratios that we have discussed—net profit margin and equity turnover. This breakdown is an identity because we have both multiplied and divided by net sales. To maintain the identity, the common equity value used is the year-end figure rather than the average of the beginning and ending value. It shows that BATBC generally increased their profit margin in the last tow years. However for higher financial leverage last year’s performance was better. 1. BATBC Ltd.is a public limited company incorporated in Bangladesh. 2. BATBC is a food and beverage types of company. 3. It is listed in the Stock Exchange Securities. 4. BATBC have category“A” share in the stock market. In case of BATBC we see that, it has been able to maintain a unique product at a premium cost that a customer will pay willingly. It has been serving the mass people of the country. As the production is in a large scale we can say it is having economies of scale. It is frequently trying to bring new products for the customers. It has a much diversified product line with frequent research and development to improve product quality and to offer innovative products according to customers taste. So, they are mainly following the Differentiation strategy rather than Cost Leadership. Besides the brand value of BATBC has made the customers less price sensitive as they emphasize more on the brand value. Well –conceived functional area strategies. Insulated from strong competitive pressures. Higher overall unit costs relative to key competitors. Enter new markets and segments. Expand product line to meet broader range of customer needs. Restriction imposed by the government. EVA is closely related to the net present value (NPV) technique where we can evaluate the expected performance of an investment by discounting its future cash flows at the firm’s WACC and when there is positive NPV, it implies that it will add to the value of the firm. In EVA, the evaluation of the annual performance of management is done by comparing the firm’s net operating profit less adjusted taxes to the firm’s total cost of capital in dollar terms, including the cost of equity. In contrast to EVA, which generally is an evaluation of internal performance, MVA is a measure of external performance-how the market has evaluated the firm’s performance in terms of the market value of debt and market value of equity compared to the capital invested in the firm. Z-Score is more then 3.0. So, there is a low probability of bankruptcy. On the hand, the management ability is very strong when it come Managements ability to compete. The profit margin was fairly consistent throughout the years. The Company pays dividend consistently in fact pays in an increasing trend every year. The Company has no chance of being bankrupt. The Company was successful to bring down noncurrent liabilities to a minimum level. The Company’s liquidity is not enough over the years. Liquidity Ratios show that BATB is not in a good position as standard to meet its current obligation. The industry average of price earnings ratio is 12.44, if we compare it with the BAT Bangladesh we find that since 2007 its EPS is above industry average. And in 2012 their EPS has climbed to 34.48 approximately, so the earning multiplier is Tk429 (=12.44×34.48). But during that period, December 9, 2012, market value of its share was Tk 409. As earning per share is increasing and that gives a positive aspect for the existing shareholders to hold their shares. Any new investor will want to include BAT Bangladesh’s share in their portfolio. In the end it is only fair to mention that British American Tobacco is a multination Corporation with strong brand value. In this study we have showed that the condition of the entire industry of security market in Bangladesh. In compare to that the total security market and industry in particular, food sector has a different position in the market. To be precise in the time of the recession the food sector remained unchanged in the security market. The security condition for BATBC is also holds promising return compared to the security market. It is highly noticeable that the stock of BATBC has higher return with lower risk. So, it would be wise to add this stock in the portfolio. Beside that the Z-score shows that the management’s ability to compete and the brand value along with it makes quite promising for the cautious investors. From the commons size balance sheet it is understood that the inventory is not so high at this moment compare to Company’s historical data. But the company should always be careful so that inventory does not pile up. Rise of operating cost, supplementary duties and surcharge on both raw materials and finished products, stiff competition from smuggled cigarettes and lack of protection from the law of the land led the turnover of the company to fall. It resulted that the profitability of the company slipped downwards sharply. BATB should create pressure on Government on smuggled cigarette issue as. 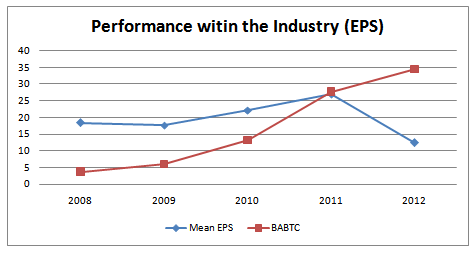 From the trend analysis it is seen that the value ratios are better in case of BATBC. BATBC gives good dividend and earnings per share are also good. The company always keeps its shareholders happy but the company should remember that their main job is to increase shareholder’s wealth not only offering high dividend.